Trying to find a document that you can't remember the file name, but know the contents of? 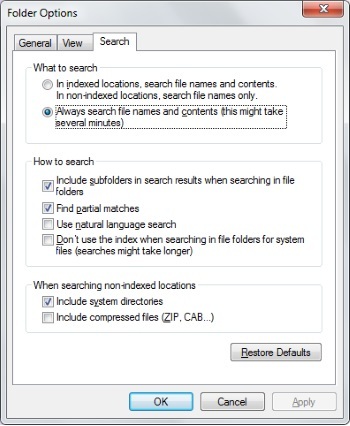 Windows 7 does not always automatically search file contents. This means if you type in a search term, it will search file titles, but not actually look through what is in each document. Use the steps below to enable content searching. 1. In the Start menu, select Windows Explorer. 2. Press the [Alt] key. This will cause a toolbar to appear near the top of the Windows Explorer window. 3. In the toolbar select Tools | Folder Options. 4. In the Folder Options dialog box that appears, on the Search tab, set the radio button next to "Always search file names and contents". Allowing this to process might take several minutes. 5. Press on the [OK] button.